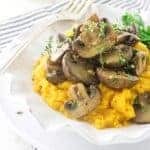 If you are searching for a great-tasting, low-stress weeknight dinner recipe, your search is over! 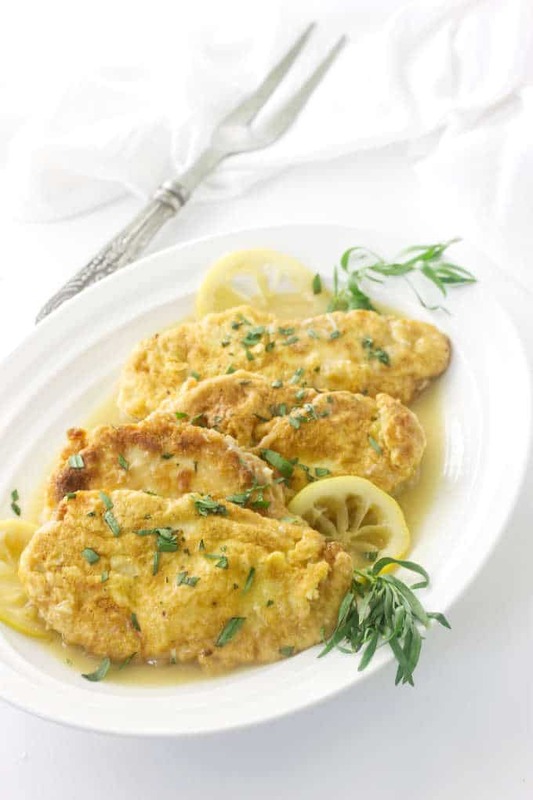 Our Chicken Francese recipe is also easy and fast, like thirty minutes and it is on the table. 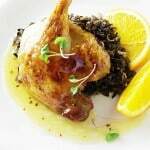 This recipe is a classic Italian-American recipe of golden-crusted chicken breasts in a rich, savory lemon-wine sauce. 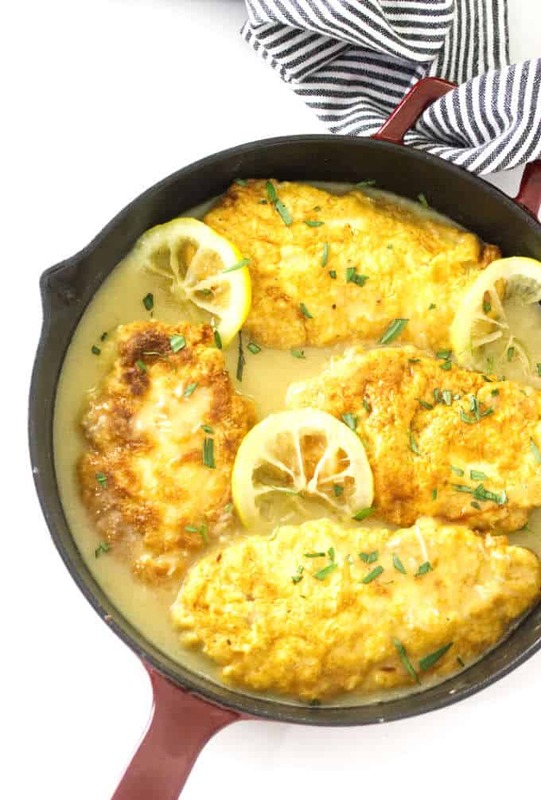 Chicken Francese has all the elements you want for a fast, healthy and delicious dinner. And you won’t believe how easy it is to prepare! How Do You Prepare Chicken Francese? The savory sauce for this one-pot main entree is made in a skillet. After browning the chicken the sauce is made in the same skillet with fresh lemon slices, garlic, wine, chicken broth, and lemon juice. We thickened the sauce lightly with cornstarch and returned the pre-cooked chicken breast to the sauce. There is another dish similar to Chicken Francese that is pure Italian called Chicken Piccata. It is just as delicious as this Chicken Francese. What is the Difference Between Chicken Francese and Chicken Piccata? There are a couple of differences in the preparation and the ingredients. Both recipes begin with thinly pounded chicken breasts. 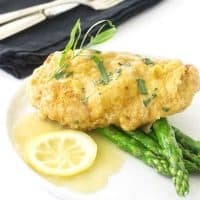 Chicken Francese dredges the chicken in flour or bread crumbs, then dipped into an egg wash and sautéed to a golden brown. With Chicken Piccata, the procedure begins with a dredging of flour then it is sautéed to a golden brown. The sauce for both recipes is pretty much the same with a base of lemon juice and chicken broth. Usually, Chicken Francese will have broth and/or white wine included in the sauce. Chicken Piccata will have chicken broth and also includes briny capers. Chicken Francese is American-Italian and subject to our American alterations such as garlic, herbs and sauce thickening agents like cornstarch. Chicken Piccata is authentic Italian fare. Both recipes are easy to prepare and well worth including in your menu planning. What can you serve with Chicken Francese? Choose a couple of side dishes. Make it a meal and whip up some parsley baby red potatoes and roasted asparagus to serve with this chicken Francese. These side dishes are fast and easy but they taste delicious. What wine can you serve with chicken Francese? If you are looking for a great wine pairing, we recommend a Sauvignon Blanc or Chardonnay. Check out the inexpensive wines we found for entertaining. They would be great picks for this meal. If you want to wrap up the meal with a dessert then try an easy peach crisp with oatmeal crumble or these dreamy crispy double chocolate cookies. I bet you can’t eat just one. Can Chicken Francese be frozen? Yes, you can freeze chicken Francese but the coating won’t be as crispy after you thaw and reheat it. The texture is really much better if it is not frozen but we don’t think you should toss out leftovers so go ahead and freeze for another day. Before freezing it, make sure it has completely cooled then seal it in a freezer-proof container. It is best to thaw it in the refrigerator overnight then reheat it on a hot skillet. We recommend separating the sauce and freezing that separately. The sauce is easy to reheat in the microwave while you are giving the chicken a quick flash in the skillet. Did you make this Chicken Francese recipe? We would love to hear from you. Drop us a comment below. 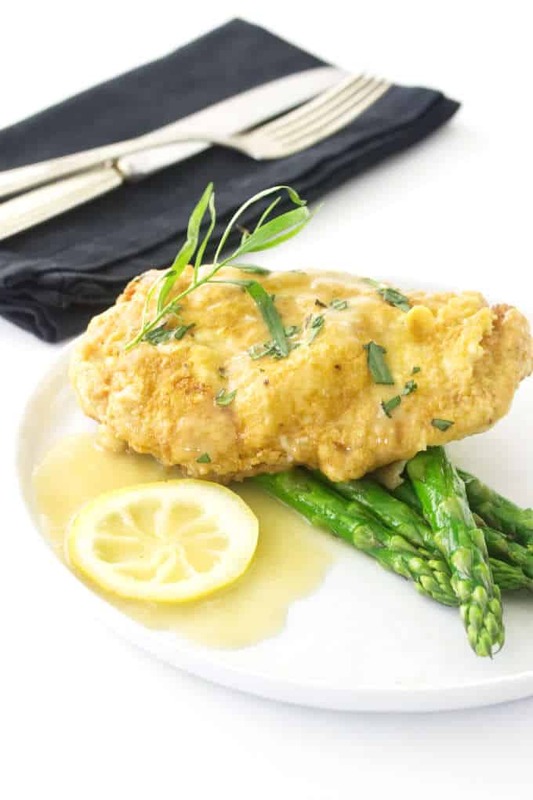 Chicken Francese is a made from chicken breasts that are coated in a mixture of flour then dipped into beaten eggs and fried to a golden brown. The savory sauce is made in the same skillet with fresh lemon slices, garlic, wine, chicken broth and lemon juice. The sauce is lightly thickened with cornstarch and pre-cooked chicken breast are added into the sauce and gently simmered for a couple minutes. Place the chicken breasts on your workspace, sandwiched between plastic wrap. Use the flat side of a meat pounder and pound each breast at the thickest end so the chicken breast is equal in thickness. Add the flour, Parmesan cheese, cornstarch, salt and pepper to a shallow dish and whisk together to combine for dredging. Add the eggs to another shallow dish and whisk with two tablespoons of cold water for dipping. In a large skillet, heat the olive oil over medium heat. Working with one chicken breast at a time, add to the flour mixture and turn to coat each side. Dip the flour-coated chicken into the egg mixture and turn to coat with egg wash. Add the chicken breast to the skillet and continue with the remaining chicken breasts. Cook the chicken breasts 2 or 3 minutes on each side to a golden brown. Transfer to a plate and reserve. Pour off all but 2 tablespoons of the oil remaining in the skillet. Over medium-low heat, add the grated garlic and the lemon slices. Sauté, turning the lemon slices and cook just until the garlic is fragrant. Add the white wine and cook for another minute or so to burn off the alcohol. Remove the lemon slices and reserve. Add the chicken broth and lemon juice and simmer gently for 3 or 4 minutes to reduce slightly. Combine the soft butter with the cornstarch, mixing with the back of a spoon mashing to a paste. Whisk the mixture into the sauce and cook to thicken. Taste and adjust seasoning if necessary. Add the reserved chicken breasts to the sauce and simmer for 2-3 minutes to reheat. When ready to serve, transfer the chicken breasts to a serving platter, garnish with the reserved lemon slices and the chopped tarragon. Pour the skillet sauce into a small dish or pitcher and serve with the chicken. 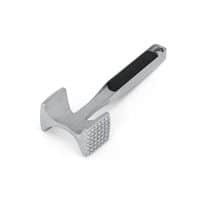 If you don’t have one of those meat mallets, the bottom of an un-opened can, or a rolling pin will be a good substitute. Pound only the thick end of the chicken breast to bring it to the same thickness as the thinner part. Mixing the cornstarch with the flour increases the coating and gives the chicken a crispier crust. Use a good dry white wine. Our suggestions are Sauvignon Blanc or Pinot Grigio. But use one that you enjoy and serve the remainder of the bottle of wine with the dinner.